The Amazon Echo is like a fancy Siri for your home, answering to “Alexa” and fulfilling your commands. Soon, Alexa will be in Volkswagens, too—assisting owners and giving updates on the status of the car from wherever. So, does that mean it’ll tell you if your car is cheating emissions regulations? Alright, alright. That was kind of mean. Anyway, the Volkswagen announcement about Alexa comes after Ford said this past week that it’ll integrate Alexa into its fleet as well. According to Engadget, Volkswagen cars that have Alexa enabled will be able to do everything the Echo device does—the Echo can tell you about the time or the weather, play music, set timers, add to a grocery list and read books to you, for example—along with some car-centered features as well. Some of those features, according to Engadget, include updating owners on the status of the vehicle and purchasing supplies for the it. Alexa will be able to tell owners whether a car is locked or unlocked, the car’s current range, how much fuel it has or if it’s charging, for electric vehicles. That is, of course, more useful when an owner isn’t in the car, since cars will tell you that anyway. Alexa can also lock or unlock the car and beep its horn, if you tell her (it?) to do so. For those who don’t keep tabs on what products their car uses, Alexa can help when it comes to ordering supplies or parts. It has to be synced to an Amazon account, but Volkswagen says Alexa can order parts or supplies that will work with your specific car if you simply tell the device what you need. Alexa can also set reminders and help with navigation, but that isn’t new or revolutionary in the world of smartphones. 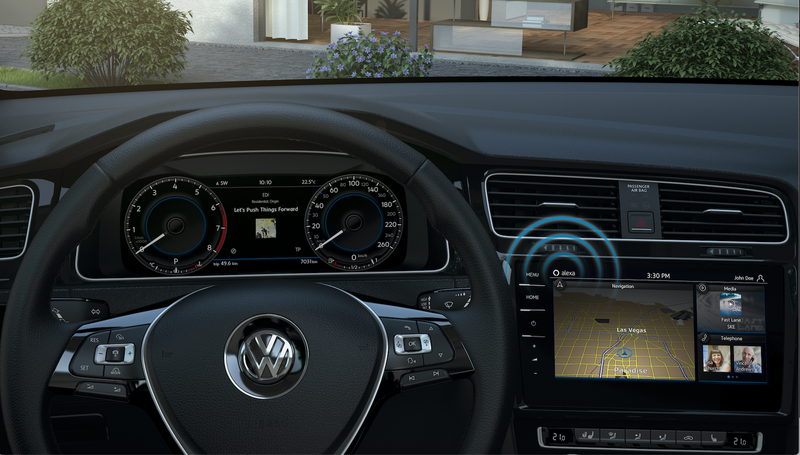 As far as when the device will be in Volkswagen’s cars, the manufacturer can’t say just yet. According to Engadget, there’s no timeframe for Alexa’s partnership with Volkswagen and the technology is currently still under development. Ford’s version will be out this summer, syncing with the cars’ infotainment systems.